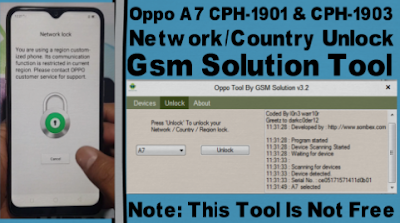 Home / videos / How To Oppo A7 CPH-1901 & CPH-1903 Network/Country Unlock By Gsm Solution Tool. How To Oppo A7 CPH-1901 & CPH-1903 Network/Country Unlock By Gsm Solution Tool. How To Oppo A7 Network Unlock? 6# Select A7 Model then click unlock tab. 7# Now install usb driver like video. 9# Select Oppo A7 Qcn file. 10# Click Restore Tab.Qcn write in process. 11# After complite remove data cable. 12# 2time factory reset your phone. 13# Now your oppo A7 network unlocking job complite.